"Doorcare South West Ltd offer a wide range of industrial shutters, to provide an effective security solution for all types of industrial premises. " 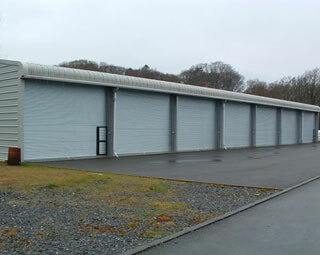 From new industrial units to factory extensions or refurbishments, these traditional hand chain and electric roller shutters are manufactured on-site at the Doorcare South West Ltd base. For projects with a more modest budget, we can offer our traditional single skin steel lath, although our premium range of industrial shutters have twin skinned insulated lath in addition to all the features of the traditional steel roller shutters. Available in a wide range of colours and sizes, they provide excellent security protection for industrial environments. Built to comply to BS-EN 13241, our range is fully guaranteed for 12 months and comes in a wide range of colours and sizes - plus there's technical back up and contract assistance from the Doorcare South West Ltd team throughout.